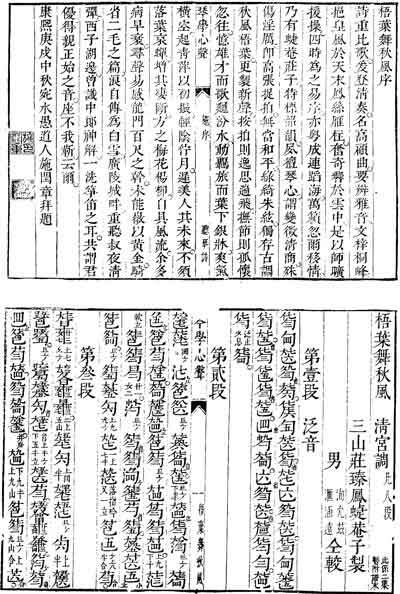 Wuye Wu Qiufeng was created in the mid-17th century by Zhuang Zhenfeng and first published in his Qinxue Xinsheng Xiepu (1664); it survives in at least 26 handbooks from then until 1914.7 Zhuang was a teacher of Jiang Xingchou (1639-1695), who presumably took it when he moved to Japan. However, it was not published in any of his handbooks there; in China, meanwhile, it is not certain to what extent the versions that can be heard played today are a result of direct transmission or of reconstruction via old tablature. I am inspired to create a new melody having perhaps encountered a beautiful turn of phrase from a famous person, or perhaps in response of a bird call or the sound of the wind; the emotion enters my ears, then my hand responds to my heart. There is also mention of a comment in 1833 saying Wuye Wu Qiufeng was the only piece by Zhuang then still played (compare the comment in 1744 that this was Zhuang's best new melody); plus quotes from 1894 that it has a smooth rhythm and was good for the development of playing skills. Wuye Wu Qiufeng is today best known through the version played by Wu Jinglue. Its transcriptions and commentary all say they come from here in 1664, but that version is somewhat different, particularly regarding punctuation (much of which later versions partially omit) and ornamentation. According to his son Wu Wenguang,9 Wu Jinglue originally reconstructed this melody in 1928 according to the 1664 version. If he did this independently (the number of late 19th century publications of the melody suggests there should also have been other people playing it at that time), presumably he then and/or later compared this with other early tablature and/or other performances, and perhaps for this reason did not always adopt the earliest phrasing. However, from my observation all of the earlier published versions, such as that of 1864, are quite similar to 1664, omitting some phrasing indications but not suggesting the apparent re-phrasing by Wu. modern: 1 2 5 5 5 6 5 3 5 1 6 , 5 5 5 1 2 , 3 3 1 3 , 3 3 1 3 2 2 2 , 6 6 6 2 1 , 2 1 6 2 1 1 .
early : 1 2 5 5 5 , 6 5 3 5 1 , 6 5 5 5 , 1 2 3 3 1 3 , 1 3 1 3 , 2 2 2 , 6 6 6 , 2 1 6 1 , 2 1 1 . This different phrasing emphasizes different notes, giving the two versions a very different flavor. As with other modern interpretations, Wu begins Section Two with two stopped dos an octave higher, divided by a double slide up and followed by a single slide up; these slides are not in the 1664 original, but from 1689 they are almost always specified. In addition, perhaps the original punctuation, as well as the theme of the melody, suggest a more ethereal flavor. In trying to capture this, though, one must recall the various commentaries in old handbooks saying that this is a beautiful melody, the rhythms of which should be easily picked up by beginners. The recording was made on 5 October using a guqin newly made by Tong Kin-Woon and silk strings by Marusan Hashimoto, newly strung (24 September 2013). Open first string = B flat; this recording replaces the one of 27 September 2013, which had open first string = G#. This title is also translated as Leaves Dancing in the Autumn Wind, Parasol Leaves Dance in the Autumn Wind, Wu Leaves Dancing in an Autumn Wind, etc. "Wu" (parasol tree, catalpa tree) is sometimes synonymous with qin, since it (often by its full name wutong) is said to be one of the best types of wood for making qins. However, since wu leaves do not create any special images in English, I have not used wu or its translation in the English title. As for literary or other references, 15169.27 is only 梧葉 wuye, adding no significant references. And 25505.223 秋風 qiufeng, as well as the entries following, also seem to have nothing connected to the present melody (none mentions 梧葉 wuye. The preface (see below) also fails to give specific references explaining the title, though there is mention of "古調秋風梧葉", which seems to mean old melodies about autumn breezes in wu leaves. Perhaps there are other similarly themed poems. Qing gong literally means "clear gong", and this piece clearly fits into the Ming dynasty standard for gong mode pieces: gong (1; do) is the main tonal center throughout, with zhi (5; sol) as the secondary tonal center. See further under Shenpin Gong Yi and Modality in early Ming qin tablature. The top half of the pdf has a preface to the melody; it is discussed further below. The 男 nan (males) 洵允兹 Xun Yunzi and 滙涵遠 Hui Hanhuan together revised it. Regarding "man" (22235.0 男), this word similarly occurs in two other places: in mentioning the same two people as having revised the first and third melodies (Taiping Zou and Shitan Zhang). Details of the first part are discussed here. Regarding the five lines of staff notation from Section 5, it seems to follow Wu Jinglue's interpretation. Other modern interpretations are mentioned below. The determination that this was Wu Jinglue's version, discussed further below, was made by comparing the transcription in QSCB, p.164, which does not include attribution or tablature, with the one in Guqin Quji I, which does (it is also available with the transcription in The Qin Music Repertoire of the Wu Family, p. 1). The original tablature details tuning, finger positions, stroke techniques and ornamentation, but does not directly indicate note values (rhythm/tempo). Traditionally this would have been learned learned from a teacher or interpreted via a process nowadays referred to as dapu. Today of course staff or number notation can be used to convey the note values. The comments here are based on examining my own transcription of the original Wuye Wu Qiufeng. To my knowledge there have been no published studies of this earliest surviving version. In fact, the strong and lively nature of Wu's interpretation (very similar to the one that I originally learned from my own teacher) is both appealing and inititally persuasive, and this has so far kept me from completing my own reconstruction based on the original tablature and its punctuation (i.e., although I have written out the earliest version in staff notation, the counterintuitive rhythms suggested to me by its ornamentation and punctuation have so far prevented me from memorizing my transcribed version). In addition, its publication date makes it later than my general repertoire. Zha Guide 34/257/-- lists it in 21 handbooks, beginning with 琴學心聲諧譜 Qinxue Xinsheng Xiepu of 莊臻鳳 Zhuang Zhenfeng; it seems to have missed two of the versions listed here and QQJC prints several more that were in handbooks not indexed by Zha. None of the later versions is a copy of the original, including the one in 1802, which otherwise has copies of seven of the melodies here. There is further comment in the chart below. QQJC XII/15, top, line 9. Xu Jian also discusses this essay further in one of his Qin essays (p.163). 9. See The Qin Music Repertoire of the Wu Family, p. 1. In doing my own reconstruction I tried using a slow tempo attuned to the irregularity of floating leaves, but found that the more I played it the faster and more rhythmic it became. One of the problems is that some of the tablature is not explained, or not explained clearly. As is common, Qinxue Xinsheng has a section (see QQJC XII/50-53 in the ToC) of finger technique explanations, but it is not complete. One finger techniques used here that is not explained at all is 次立; then two that are not clearly explained are 𠂊, which should represent 急, but this does not seem likely when attached to notes with ornaments or that are said to be held (省); as well as one that seems to represent 度 . 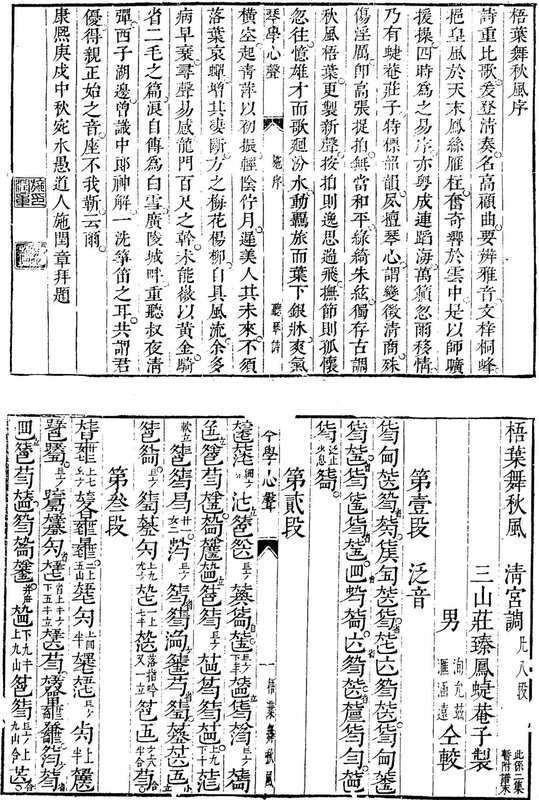 The preface here was written 宛水愚道人施閏章 at Wanshui by the Foolish Daoist Shi Runzhang (1618－1683), a well-known poet from 宣州 Xuanzhou in Anhui; Wanshui seems to refer to Jiyunlou, his villa there (寄雲樓：宛水東岸施愚山別墅). It is dated 庚戎中秋 mid-autumn of 1670, i.e., six years later than the original handbook (some commentary suggests that the last two melodies in the handbook were a later attachment, along with the poems and essays that followed). Then on lines 6 and 7 it mentions "獨存古調秋風梧葉 solely preserving the old melody autumn breeze in wu leaves". It is not clear whether this refers to a specific melody title, Autumn Breeze in Wu Leaves, or whether it refers to the fact that the phrase 秋風梧葉 qiufeng wuye can often be found, as in the Dai Fugu poem above. Otherwise, the preface does not seem to expand on the melody details that followed. Further comment above; based mainly on Zha Fuxi's Guide, //. (1849; XXIII/430) 8; similar but adds some lines next to tablature: for phrasing? (1876; XXV/199) 8; gongyin gongdiao; "from 1833"